Are you excited for snow? Tons of it? Or perhaps just a few inches? No? Neither are we, but every year, the snow comes and we can’t stop it. It blows, it’s cold, and it usually stays until the end of March which makes each and every one of us get out our coats, our gloves, our boots, our shovels and our snow blowers. In light of that, here are some tips to keep your hands and fingers safe while using your snow blower. Each year, hundreds of individuals suffer damaging injuries or amputations of their fingers or hand(s) due to improper and unsafe operating/handling of snow blowers. Most victims of the snow blower’s fury are middle-aged men. Sorry, Guys! And, those middle-aged men injure their dominant hand 90% of the time, so please be careful. Typically, a snow blower accident results in amputation of your fingertips with the middle finger most commonly being injured. Have we mentioned that you should be careful when using a snow blower? There’s sort of a perfect storm of conditions, which lead to most injuries. Most injuries occur during heavy, wet snowfall of 4+ inches of snow, and these two conditions are more likely to happen if the temperature is right at or around 28 degrees. It’s important to note that nobody just randomly decides to stick their hands into a snow blower, but when it’s cold outside and your snow blower jams up, you want to get it clear as quickly as possible. Snow blowers are safe and effective when used properly! After your visit to the emergency room, your primary care physician will probably refer you to an orthopedic hand specialist. Not all cases require surgery, but many patients will receive a custom splint made by an occupational therapist or hand therapist. 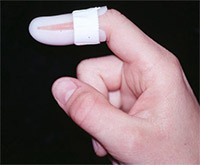 That splint is there mainly to protect your finger from further damage and to allow the finger(s) to heal. After your finger(s) heals, you will probably return for some type of follow up therapy because of the amputation. Therapy in these situations focuses on regaining range of motion and grip strength resulting in functional use of the hand again. Your therapist will also help to reduce scar tissue and eliminate skin hypersensitivity via a desensitization program.